Mini editions of board games may not be really easy to play, unless you have very tiny fingers. But they are very cute stocking stuffers, or even great little ‘loot bag’ gifts for kids’ parties. Each game is fully playable, but most people are content just to fuss over how adorable it is! A nice, affordable gift for a board game collector. 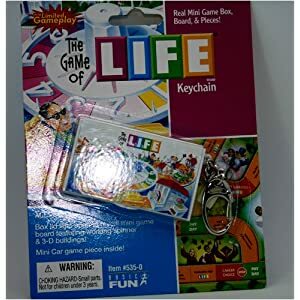 If you own The Game of Life keychain, please rate it by clicking on the Comments link below the eBay listings.